Kuala Lumpur, Malaysia (BBN) – The International Olympic Committee (IOC) awarded the 2022 Winter Olympics to the city that hosted an “exceptional” games in 2008 and promises to do even better this time. Beijing beat Almaty by 44 votes to 40, with one IOC member abstaining, to become the first ever city to host both summer and winter Olympics, reports Xinhua. 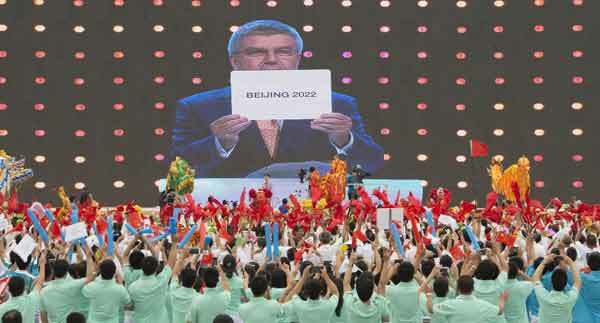 The Chinese capital and its co-bidder Zhangjiakou erupted with joy as IOC President Thomas Bach announced the the decision in the Kuala Lumpur Convention Center. Chinese President Xi Jinping threw his weight behind Beijing’s bid, reiterating the nation’s passion for the Games in a video speech played during the final presentation to the IOC members early in the afternoon. “The 2022 Olympic Winter Games if held in China will boost exchanges and mutual understanding between the Chinese and other civilizations of the world, encourage more than 1.3 billion Chinese to engage in winter sports with interest and passion and give them yet another opportunity to help advance the Olympic movement and promote the Olympic spirit,” Xi said. “The Chinese government highly appreciates the Olympic values and the IOC’s initiative of reform. A 12-member Beijing panel made a passionate presentation hours earlier. Chinese Vice Premier Liu Yandong and former NBA star Yao Ming also weighed in. The panel explained how the bid met the Olympic Agenda 2020 principles, promising athlete-centered, sustainable and economical Games, while giving much more: an opportunity to grow winter sports in the world’s most populous country, as well as a buzzing environment of a modern city and sporting action at the foot of the Great Wall. Beijing Mayor Wang Anshun vowed to deliver “Games that is joyful and harmonious, Games that is safe and reliable”, while Chinese sports chief Liu Peng claimed “winter sports fever is sweeping our nation”, adding that more than one million Chinese teenagers were now ice skating regularly. “We now have 500 ski resorts and 20 years ago we had less than 10,” Liu said. Almaty, the former capital of Kazakhstan, bowed out with grace. Its message of a compact Games with atmosphere and a wintry setting was not quite enough to get it across the line. A global destination for international travelers, Beijing will offer a Games with world-class accommodation, efficient transport, diverse gastronomy and endless entertainment, combined with the history and natural beauty of snow-sport venues Zhangjiakou and Yanqing. Modern, quick and efficient transport is a key element of the Beijing 2022 bid. An integral part of the government’s Beijing-Tianjin-Hebei Intercity Rail Master Plan, the construction of the Beijing-Zhangjiakou high-speed rail link already began last year and will be fully operational by early 2019. So spectators will be able to enjoy winter sports scenery and the life of a modern cosmopolitan city all in one day. Yanqing is part of the Beijing Municipality, but even on its own the county registers a steady annual tourism growth of 4.3% with a rocketing hotel and services development boosted by preparations for the 2019 World Horticultural Expo. Zhangjiakou is a rapidly developing winter sports destination which has become very attractive to hotel and resort investment and has been seeing an average annual growth of 28.2% in hotel guest nights over the past three years. Helping create a thrilling festival atmosphere for visitors, the Beijing 2022 Games will coincide with the Chinese New Year giving visitors the chance to enjoy the widespread celebrations and festivals. Beijing, in full alignment with the principles of the Olympic Agenda 2020, stresses sustainability as one of the key pillars of the Games plans. Beijing 2022 will take full advantage of both the tremendous Beijing 2008 Olympic and Paralympic Games legacy – including existing competition venues, infrastructure and people with deep operational experience – and having a clear vision of how the 2022 Olympic and Paralympic Winter Games is integrated in China’s existing regional economic development plans. A key element of the country’s existing plans is the development of a winter sports industry and meeting a growing demand for recreational activity and sport. Beijing 2022 will re-use 11 of 12 competition and non-competition facilities post-2008 including four iconic venues – Bird’s Nest National Stadium, Water Cube National Aquatics Center, Wukesong MasterCard Center and the China National Convention Center (CNCC). These four venues are excellent examples of the concept of sustainability. Over the past seven years, they have grown into the “go-to” multi-purpose arenas for Beijing’s biggest events, fulfilling the principles outlined in the IOC’s Agenda 2020 and setting a new standard of sustainability for the future of the Olympic Movement. The venues also have responded to Beijing and China’s growing interest in winter sports by hosting an increasing number of winter-sports related events. The 2008 Olympics also left a pool of high-level professionals. Ten million employees in areas as broad as venue design and construction, sports, marketing, hospitality, medical services, media operations, transport and many more, as well as 100,000 volunteers, offer the most unique experience that exists: delivering the biggest world sports event ever. Air quality and snow conditions are regarded as two of the major challenges for Beijing, but the bid officials have given an answer and solution to all the concerns. In an effort to tackle air pollution, Beijing upgraded its coal-fired heating system in urban area to natural gas heating system and closed down heavy-polluted plants. Neighboring city Tianjin and provinces including Hebei adopted similar measures. Lack of natural snow was considered as a disadvantage for the 2022 host. But the climate conditions in Zhangjiakou’s Chongli county, where cross country, freestyle and other skiing events will be held, won’t be a concern. “In last snow season in the Chongli resort, the snowfall is 70 centimeters, so that’s enough for Winter Olympics Games,” said Zhangjiakou Mayor Hou Liang. With a high standard set by the city’s 2008 Olympics, Beijing and Zhangjiakou are now looking to raise the bar even higher. As President Xi said, the Chinese people “will present to the world a fantastic, extraordinary and excellent Winter Olympics”.